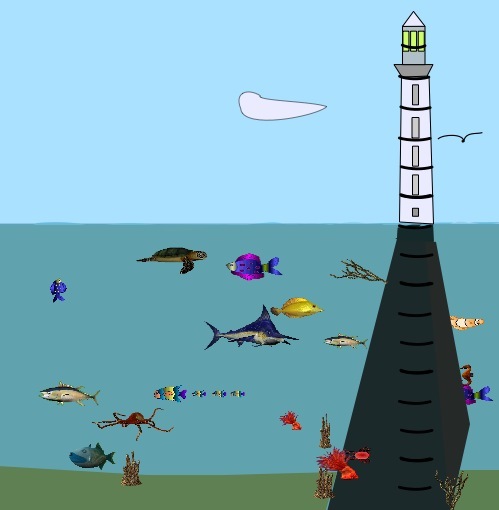 Well, here's a pretty scene, the underwater creatures and the tall lighthouse joined by a seagull and a cloud in the sky. There are black markings all the way up the lighthouse and on the support for the lighthouse going down to the sea bed. These markings are $1$ metre apart. I have left the numbering for you to do. The sea level is of course "$0$" and then positive numbers going up and negative numbers going down to the sea bed. If we think about the mouths of the creatures then we can see how much deeper they are from each other, or what distance they are apart. For example the (mouth of) the fierce looking blue and white fish near the middle is $1$ metre deeper than the (mouth of) the golden yellow fish. 1. What number should be where the light shines from the lighthouse? 2. What number should be where the (head of the) seagull is? 3. What number should be where the (mouth of the) red crab, near the bottom, is? 4. How far is it down from the (head of the) seagull to the (mouth of the) yellow fish? 5. How far is it from the turtle, near the surface of the water, to the crab? 6. There's a little brown sea-horse to the right of the lighthouse support. How far from the surface is it? 7. How high above the sea level is the seagull flying? 8. How far is the seagull from the sea-horse? 9. How high is the pointed end of the cloud? It would be interesting to know how you arrived at your answers. Did you write anything down to help you? How about thinking up some questions of your own? Please do send them in - we would like to see your creative juices at work! Investigations. Multiplication & division. Interactivities. Combinations. Addition & subtraction. Positive-negative numbers. Working systematically. Place value. Generalising. Trial and improvement.